New Build Doc: "Build Your Own DS-1 Distortion"
Greetings everyone! Miqbal and I have been working together on this document for the past couple of weeks. In a nutshell, it contains an accurate schematic reverse-engineered from actual DS-1 pedals, as well as a true-bypass version of the DS-1 derived from the stock schematic. In addition to the schematics, it contains PCB layouts and build information so you can build either a stock DS-1 or true-bypass DS-1 from scratch. Please note that this document provides information regarding the post-1994, dual op amp DS-1, not the "vintage" DS-1 based upon the TA7136P. We are considering adding "vintage" DS-1 build information at a later time, but this initial version focuses on the post-1994 DS-1. Aron generously granted us permission to host this document here at diystompboxes.com. (Thanks Aron!) 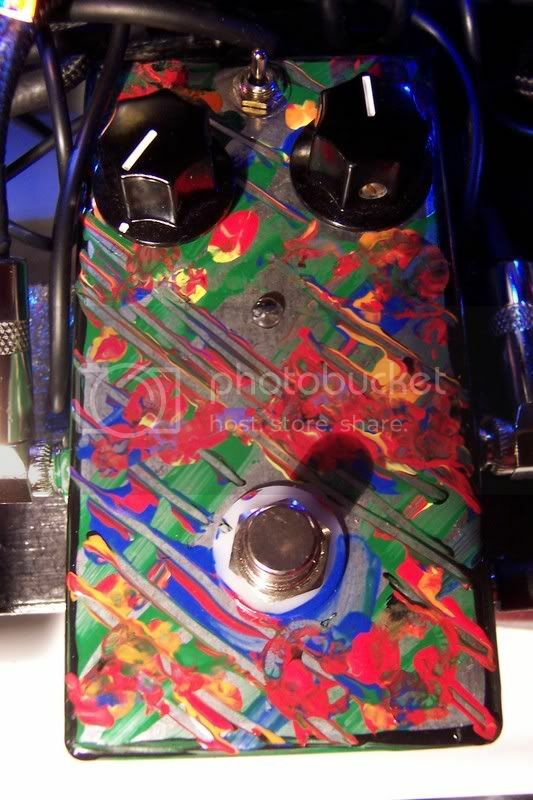 You can view the file here: http://www.diystompboxes.com/DIYFiles/up/Build_Your_Own_DS-1_Distortion.pdf. Please post any questions or comments you may have regarding this information in this thread. If you find errors in the document, please e-mail me with the corrections and I'll take care of updating the document. 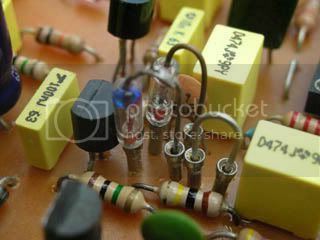 If you're building or modding a DS-1, please check out my 'Build Your Own DS-1 Distortion' doc. Thanks! Re: New Build Doc: "Build Your Own DS-1 Distortion"
WOW fantastic! Can I assume that IndyGuitarists mods can be implemented on this unit? now that is a project file! great work. One question - the OpAmp pins are labeled opposite the data sheet. Are the pin numbers correct, or the input polarities? EDIT - I should be more specific. The first OA in the "True Bypass" schematic shows pin 2 as the non-inverting input. This is opposite the data sheet. Pin 5 is correctly shown as the non-inverting input of the second device. Miqbal and I tried to keep the plans as true to stock as possible (right down to using the correct color codes for wiring on the 'Stock DS-1 Wiring' diagram.) The true-bypass implementation lops off the input/output buffers and switching flip-flop circuit, but other than that, it is as close as we could come with using DIP-8 op amps. So most DS-1 mods you find on the Internet should work with both the 'Stock DS-1' and 'True-Bypass DS-1' layouts. 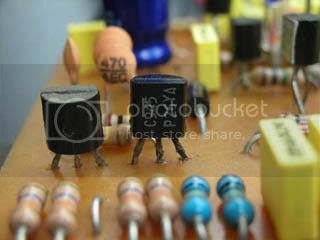 Dave, you were correct about the non-inverting input label on IC1A on the 'True-Bypass DS-1' schematic. I made a labeling error, which I've now fixed. The corrected document has been posted at the same URL, http://www.diystompboxes.com/DIYFiles/up/Build_Your_Own_DS-1_Distortion.pdf. Once again... great job, dude!! All of you here have been so helpful and so inspiring. Thanks to you all!! 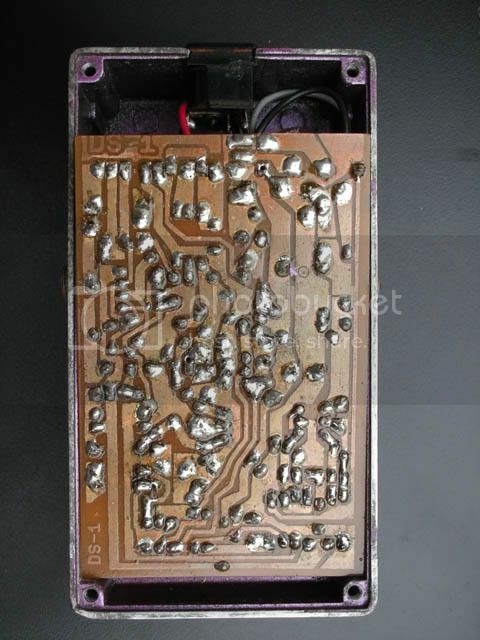 Apologies for the oversight, but we've corrected the document and uploaded it to the same location: http://www.diystompboxes.com/DIYFiles/up/Build_Your_Own_DS-1_Distortion.pdf. If you've already downloaded the document, please download the latest version. Great job! Very thorough and complete. This will come in very handy. Im super impressed!!!! I wanna go in on a project like this with someone. Maybe for the sd-1 or something else. Huge thanks!!! It makes me wanna buy a ds-1 just to mess with it ect..
"I think somebody should come up with a way to breed a very large shrimp. That way, you could ride him, then after you camped at night, you could eat him. How about it, science?" Thanks. I've got old SD-1 service papers as well, but given its similarities to the Tube Screamer family (and the fact that R.G. has documented its details so thoroughly), I'm holding off on doing a similar document for the SD-1 at this time. Besides, I've got to get some building and playing done before I try again to become Roland Corp's least-competent (and least-compensated) freelance technical writer. If anyone is interested in the tools used to create this doc, here's the quick list: 1) Eagle CAD (used by miqbal for his schematics and layouts); Visio 2007 (I used this for my layouts, schematics, wiring diagrams and drilling templates); 3) Word 2007 was used to create the build document and publish it to PDF format. Other than that, it took a week or so of Muhammad and I bouncing revisions and suggestions back and forth to each other by e-mail before we got a version we were happy with. FYI, I've written a new appendix for this DS-1 doc that describes a mod to make the post-1994 DS-1 sound more like the pre-1994 "vintage" DS-1. I'm going to put the mod in a mule DS-1 I've got hanging around to verify the results. Once verified, I'll post an updated version of this doc with the "MIJ-Mod" in it. Will be interesting to see how the 'old and new' and the 'intermediate chronocologically' DS-1's compare. The first one I had was an old one, the other two were very different. Convention creates following, following creates convention. The three post-1994 DS-1 pedals I have are all pretty similar, in that they are based upon the M5223AL. I've been tempted to pickup a pre-1994 pedal for testing purposes. But to be honest, from all the various sound clips I've heard on the Internet of the vintage pedals, they sound different, but not necessarily better than modded post-1994 pedals. So while I was contemplating picking up a MIJ DS-1 for $85 the other day on eBay, I got curious about the differences between the pre- and post-1994 pedals. 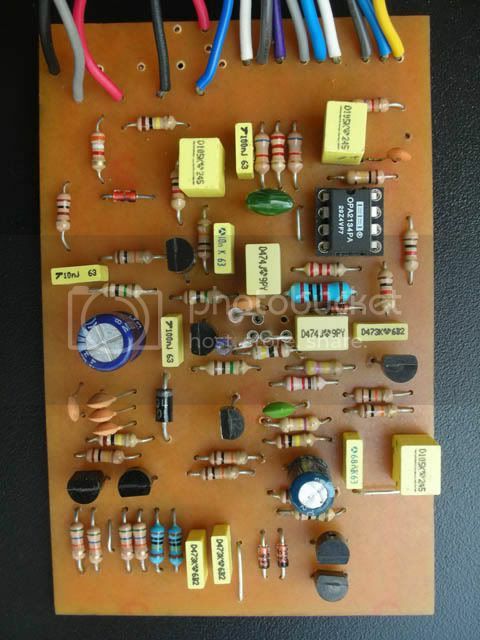 After comparing miqbal's schematic with the 12-26-1980 schematic that is all over the Internet, I found 26 components that were either a different component value or missing on one or the other. 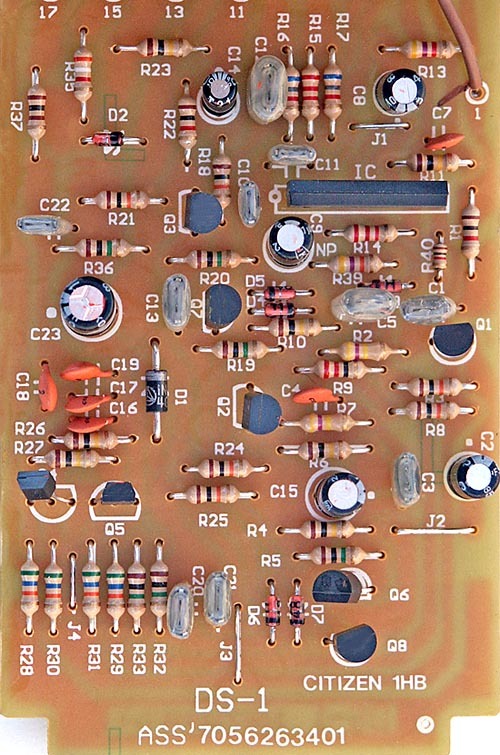 Ten of those 26 components were signal diodes and NPN transistors...all of which compare very closely to the parts in the post-1994 DS-1. After researching what the remaining 16 components did in their respective circuit positions, I narrowed the potential mod list to 6 components that could be easily changed and steer the tone of the post-1994 DS-1 closer to that of the vintage pedal. In the new appendix, I go through all the differing components and give my reasons for why I believe some should be left out of a "vintage" mod on a post-1994 pedal. While it's not possible to completely convert a post-1994 pedal to pre-1994 at a component and circuit level, it does appear possible to get the two pedals closer in terms of tone. But all that is theoretical at this point. Once I get the vintage, "MIJ-Mod" built, I'll be able to judge if the mod is worthwhile or not. I'll have some sound clips to share at that point as well. I've got a 4th DS-1 on its way to my shack, so I'm hoping it's the "new" DS-1 that is rumored to have a new op amp in it. My last two new DS-1 pedals still had the M5223AL in them, but once I get my hands on the alleged "new" version, I'll be interested to hear how it differs from the post-1994 pedal. I won't be able to compare it to a true MIJ DS-1, but I'll post sound clips of the MIJ-Modded post-1994 for the vintage pedal owners to judge. OK, temptation won out and I've got an MIJ DS-1 heading my way now. Rather than doing a theoretical replacement mod based purely upon schematic research, I'll now tune the post-1994 MIJ-Mod to make it closely approximate the sound of my pre-1994 DS-1. I'll update y'all once I've got the mods and side-by-side testing done. Great stuff. I know this has come up before, but the 47pf cap in the Keeley Mods looks like to me that it should be 470pf or even 4.7n. I don't think 47pf is going to do much. Rather than populating all the components at once, for the first step, I simply populated only the main distortion circuit, i.e, no input/ouput buffer, no FET-switching and no Keeley's Mod. 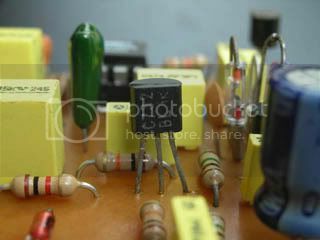 After making sure that everything is OK for the main distortion circuit, I continued to populate the whole rest components. I think, for a DIY level PCB, the ground pouring on the layout is just too much.... or maybe too close to the pads Maybe I have to follow Gauss's suggestion: put an order from a PCB manufacturer! 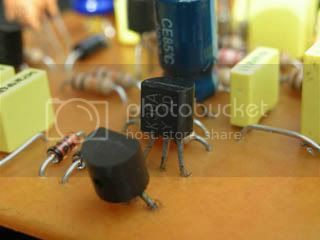 These are some pics for the semiconductors. 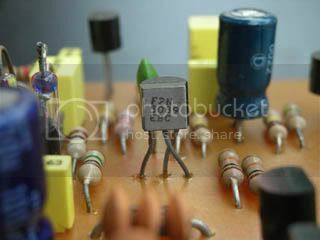 I even salvaged the HM-2 Germanium diodes! 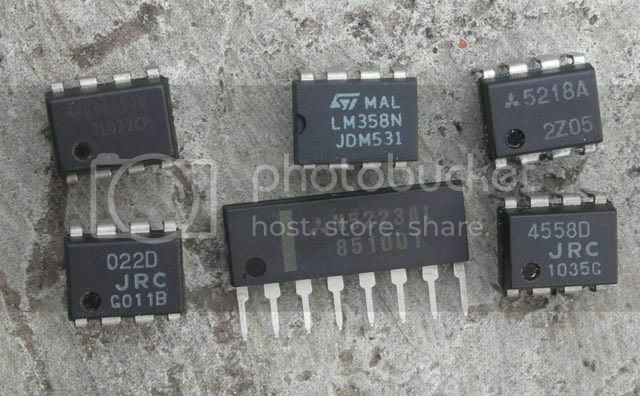 The candidates for the fx "processors": (clockwise from top-left corner) TL072, LM358, M5218A, JRC4558, M5223AL, and JRC022. I forgot to put the NE5532 in the picture. I'm unable to try out the M5223AL (SIP). The best sounding chip is, for sure, the Burr-Brown OPA2134. 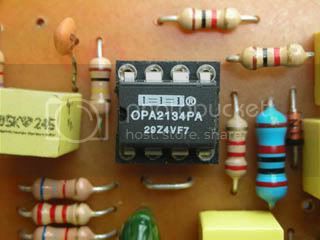 The closest to the OPA2134 (probably the same, according to my ears) is the LM358, both are like magic to this circuit. The other chips are absolutely AWFUL. Nice looking build, Muhammad. Your PCB looks good and will work great in more recent BOSS enclosures with the PCB-mounted power jack. I've never tried the LM385N in a DS-1. In fact, I don't have any in my chip stash either. I'll have to pick one up and give it a shot side-by-side with a M5223AL-equipped DS-1. I personally run OPA2134PA chips in all my DS-1 pedals EXCEPT for the one post-1994 with the MIJ-Mod. If the LM385N sounds close to the OPA2134PA, then I'll add it to the list of good-performing op amps for the post-1994 DS-1. FYI, I've also got my testing completed for the MIJ-Mod. I'll be posting more about it momentarily. I've updated the build doc with information about a new mod (the "MIJ-Mod") that makes the post-1994 DS-1 sound remarkably similar to the pre-1994 MIJ DS-1. - Appendix B: How Do I Modify My Post-1994 DS-1 To Match The Original DS-1? The 'Brett Miller DS-1 “MIJ-Mod”' section provides information on how to perform this simple, yet great sounding mod to your post-1994 DS-1. Appendix B give you background information about the component-level differences between the post-1994 DS-1 and the pre-1994 DS-1. Appendix B also provides commentary/analysis about the details and potential impact of each component difference. You can download the updated doc from the same location as the original: http://www.diystompboxes.com/DIYFiles/up/Build_Your_Own_DS-1_Distortion.pdf. So if you have a stock, unmodded post-1994 DS-1, three capacitors stand between it and the vintage DS-1 sound.